Posted on 12, September 2016 by EuropaWire PR Editors | This entry was posted in Apparel, Fashion & Beauty, Germany, Marketing, Technology, Telecom and tagged "Fashion Fusion" challenge, adidas, Anita Tillmann, Antje Hundhausen, Christian von Reventlow, Christin Eisenschmid, Deutsche Telekom, Digital Champion, Dirk Schönberger, ElektroCouture, Fashion Fusion Lab, Gala, German Research Center for Artificial Intelligence, Intel Deutschland, Lisa Lang, Markus Luft, Nikolaus Röttger, Patron Claudia Nemat, Premium Exhibition, Prof. Dr. Gesche Joost, Prof. Dr. Paul Lukowicz, WIRED Germany. Bookmark the permalink. 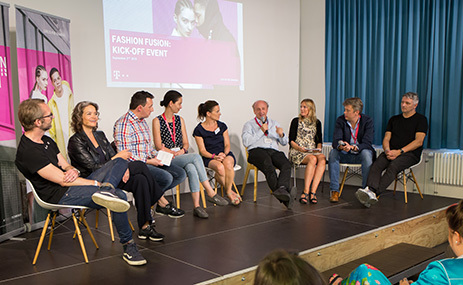 BONN, 12-Sep-2016 — /EuropaWire/ — “Unfolding the Future of Fashion and Technology” is the motto of the Fashion Fusion Challenge, unveiled by Deutsche Telekom in May. Creative minds from across Europe had two-and-a-half months in which to submit their ideas for revolutionizing the world of fashion technology. Today, the jury will be announcing its shortlist in this international competition to find the next big thing in smart fashion, as the contest moves into its next phase: On September 19, the most promising talents will move into the Fashion Fusion Lab in Berlin to develop prototypes of their ideas, supported by an international team of experts. The entries include intelligent gadgets for cyclists, smart costumes for musicians, and impressive, sculptural visions of high fashion. 120 contestants from 25 countries responded to Deutsche Telekom’s invitation to develop visionary concepts linking high-tech and fashion, and become the fashion trend-setters of the future. The jury, made up of well-known figures from the worlds of industry and fashion, whittled them down to the best ideas in the three categories Connected Devices & Accessories, Digitally Enhanced Fashion and Smart Services. The jury members are Anita Tillmann (Premium Exhibition), Dirk Schönberger (Adidas), Markus Luft (Gala), Christin Eisenschmid (Intel Deutschland), Prof. Dr. Gesche Joost (Digital Champion), Nikolaus Röttger (WIRED Germany), Antje Hundhausen (Deutsche Telekom), Prof. Dr. Paul Lukowicz (German Research Center for Artificial Intelligence), Lisa Lang (ElektroCouture) and Christian von Reventlow (Deutsche Telekom). Their criteria for selecting an idea included its relevance and long-lasting benefits for consumers, its market potential, and the fusing of high-fashion with convincing functionality that will withstand even the toughest scrutiny from the fashion world. Patron Claudia Nemat, Board member for Europe and Technology at Deutsche Telekom, explains: “120 entries from 25 countries represents fantastic feedback for our Fashion Fusion contest. The response proves that smart fashion is considered a relevant future topic worldwide. I am delighted that we can give twelve young talents the opportunity to translate their concepts for high-tech clothing, wearables or digital lifestyle products into marketable commodities. The market for smart fashion is still in its infancy, but I am convinced that in future, we will see many functions migrating from devices into clothing”. From September 19 until the end of the year, the finalists will inhabit the Fashion Fusion Lab at Deutsche Telekom’s Digital Innovation Arena in Berlin, where they will work on making their projects a reality with some expert assistance. Lisa Lang, CEO of ElektroCouture and curator of Fashion Fusion Challenge, is in charge of program management. In collaboration with the jury and coaches, she organizes workshops on “Smart Textiles & Electronics” for the talents, as well as master classes with a chance to meet the experts, impulse lectures, and insights into the latest research in fashion & technology. Design courses on 3D printing, laser cutting and product development are also on the agenda. Fashion Fusion is supported by Intel, WIRED Germany and Adidas, together with #FASHIONTECH Berlin. Fashion Fusion Lab’s partners also include S. Oliver, Osram, Fab Lab Berlin, Styleproofed and Trotec Laser, Forster Rohner Textile Innovations, Statex and Sourcebook, who will provide expertise and technical equipment.